The royalists rejoiced: at 12 pm, Saturday, May 19, Meghan Markle waltzed resplendently down the aisle at St. George’s Chapel at Windsor Castle in a white Givenchy gown designed by the brand’s British artistic director Clare Waight Keller. The announcement came from Kensington Palace. Bookmakers predicted Ralph & Russo, Roland Mouret, Alexander McQueen, Victoria Beckham and Erdem. Eschewing from extravagance, the understated bonded silk cady dress was developed by the recently-appointed Waight Keller after months of extensive research in various fabric mills across Europe. There will, of course, be some objections to the focus on the expert craftsmanship of a French fashion house at a wedding that is now engrained in British culture. It solidifies the believe that British culture is a melting pot of a myriad of nationalities, ethnic profiles and that Britain is enriched by its international connections. Therefore, it may not be that surprising: the bride is an American, after all; Waight Keller is a British woman working in France. Ms. Markle wished to imbue her design with this sense of wordiness, requesting the 52 countries of the Commonwealth be represented in her gown. 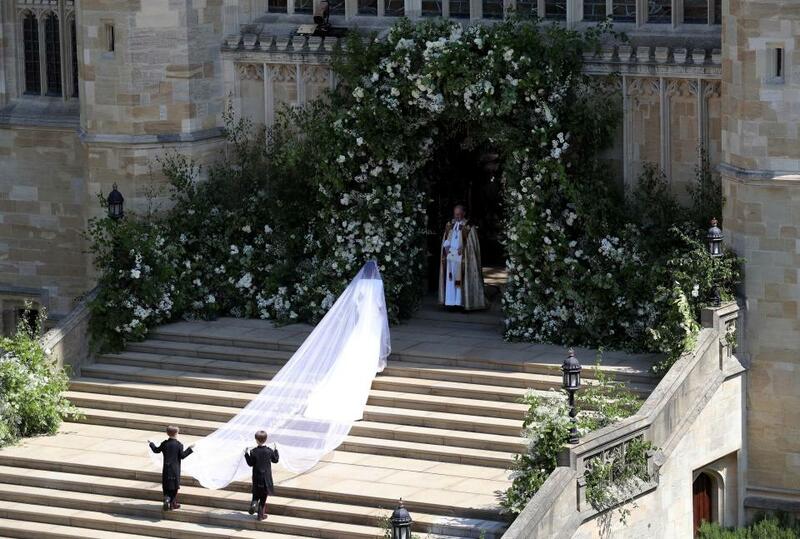 The five-metre-long silk tulle veil, designed by Waight Keller, incorporates the flora of each Commonwealth country in silk threads and organza. The California poppy, inspired by Ms. Markle’s home state, also makes an appearance. 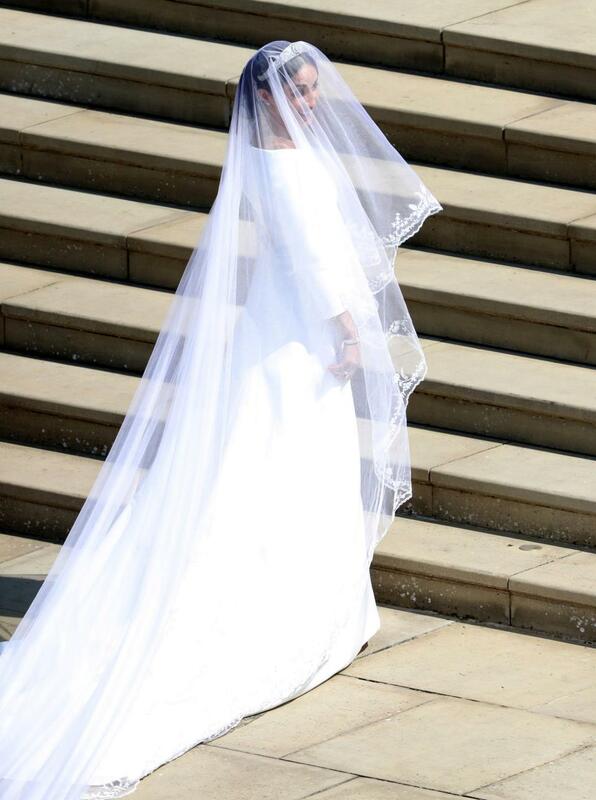 The veil is held in place by Queen Mary's diamond tiara, lent to Ms. Markle by HRH Queen Elizabeth II. Some speculated Ms. Markle would select Gianvito Rossi heels. She previously stated in an interview, with an Irish publication, the Italian brand was her favourite. However, they were Givenchy too. Other guests at the Royal Wedding also responsible for flying the flag for British fashion. They included HRH Queen Elizabeth II in a multicoloured dress by Stuart Parvin and a matching Angela Kelly hat; lawyer Amal Clooney and actress Oprah Winfrey represented Stella McCartney. 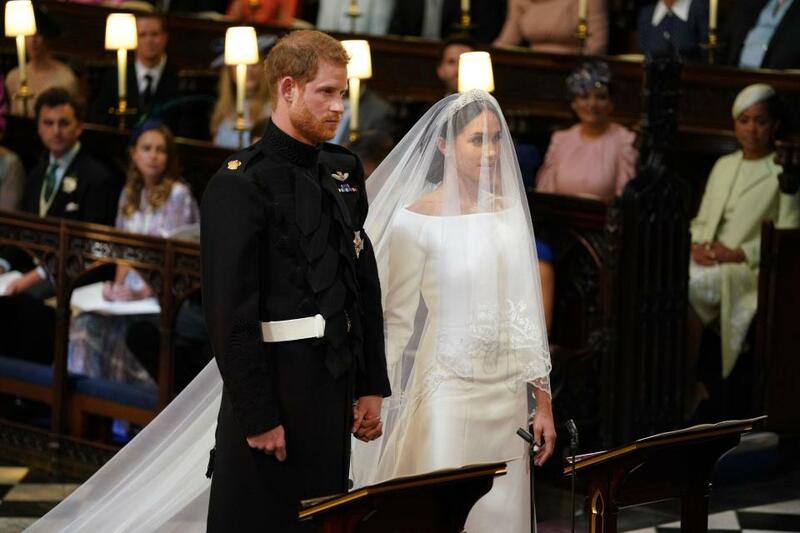 Idris Elba, like the bride, wore Givenchy by Clare Waight Keller; David Beckham unveiled Kim Jones’ Dior Homme (another British export at a French fashion house) while Victoria Beckham wore her own creation. But it’s the image of Ms. Markle in white, and an impressive train trailing behind her, that will be among the defining images of British—and global—fashion in 2018. Not only this, the design will influence brides around the globe for the next decade. British Vogue preempted the event with their June cover dedicated to the Royal Wedding. Steven Meisel photographed Cara Delevingne in an array of ivory creations. However, should they wish to emulate “timeless minimal elegance” they should look no further than Ms. Markle. The Royal Family’s presence in the United Kingdom and the Commonwealth generates enormous revenue for governments. Their contribution to the economy is invaluable. Images, merchandise and wedding paraphernalia will account for millions in revenue. Take for example the hundreds of thousands that congregated at Windsor for the weekend with masks, cardboard cutouts, and signs. The wedding dress—the speculation around it, the images that will dominate social media, newspapers, and magazines in the coming weeks—is indicative of fashion’s power. From industry folk to those uninvolved with the fashion industry, widespread speculation, and admiration of a wedding dress signifies fashion’s influence. It will have people talking for months—years even.